When you look in the mirror and smile, are you happy with the results? Some people are happy, some are not. In some cases, too much of their gums is visible around their teeth which creates a “gummy” look. Others may dislike their smile because their gums have receded so much that their teeth look much longer than normal. Regardless of whether you’re showing too much gum or not enough, aesthetic gum surgery may be able to help you solve the problem and feel better about yourself and your smile. You can arrange for an individual consultation with our professional who is skilled in cosmetic dentistry so that he or she can evaluate your teeth and gums to determine whether your problem warrants this type of surgery. What is aesthetic gum surgery? Aesthetic gum surgery actually includes more than one type of procedure, depending on your particular problem. If you have too much of your gum line showing when you smile, the surgery will involve removing some of the extra bone and gum in the area. If you don’t have enough gum showing, then your dentist may take tissue from elsewhere in your mouth and use it to improve the appearance of another specific area. Regardless of which procedure you are having done, the entire process will most likely take place in your cosmetic dentist’s office. Your dentist will probably use a local anesthetic to numb the area so you won’t feel any pain. If the procedure is being done to your entire mouth, however, your dentist may recommend using a general anesthetic so you’ll be asleep through the whole procedure, which will help with any feelings of anxiety that you may have. Aesthetic gum surgery procedures do vary, depending on the problem being corrected. If you have a “gummy smile,” then your dentist will first administer the anesthetic and make sure that you are comfortable and relaxed. Next, he or she will use special instruments to remove small parts of the gum tissue so that not as much will be visible. In some cases, the dentist may also need to cut through the gum to reach the underlying bone. He or she will then remove a portion of the bone and a portion of the tissue before sewing the gum up. This procedure is known as a Gingivectomy. If your gums have receded so too much of your teeth are showing, then your dentist will probably perform a gum graft. Before your procedure, your dentist will carefully examine your mouth to find areas of healthy gum tissue. 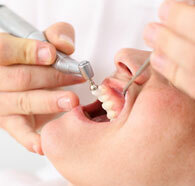 The dentist will remove the healthy gum tissue and will attach it to your existing gum line. If you do not have enough healthy gum tissue available, your dentist may recommend using a specially designed artificial membrane instead. The membrane won’t look any different than your normal gums, and it serves the same purpose. Depending on the amount of work required, both procedures usually take between 30 to 60 minutes to complete.